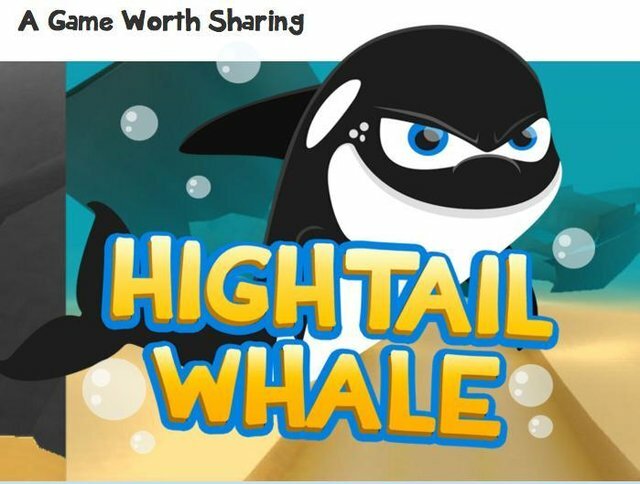 At first glance, Hightail Whale may appear to be just another gaming app. But start to play, and you'll realize this game is different. Why? It's gaming with a purpose, and could very well make a significant impact on the welfare of captive marine mammals. 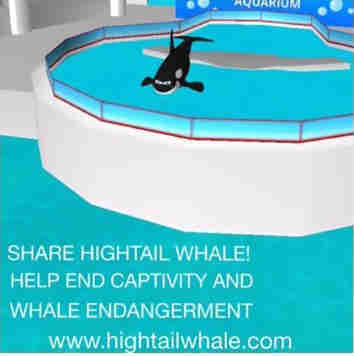 Every game play helps to further the anti-captivity message, as cetaceans break out of their small $laveWorld Aquarium tanks to swim to freedom in the open ocean. It's designed to educate, inspire, and bring about change through an adventurous medium, and is the creation of British Columbia-based Eco Game Solutions, Inc.
Michael Epp, the company's president, and Brad Chretien, digital marketing overseer, are Hightail Whale's co-creators. The original game concept was sparked when Michael and Brad discovered a shared passion for helping orcas and marine mammals, then realized the potential of combining their talents for a greater good. 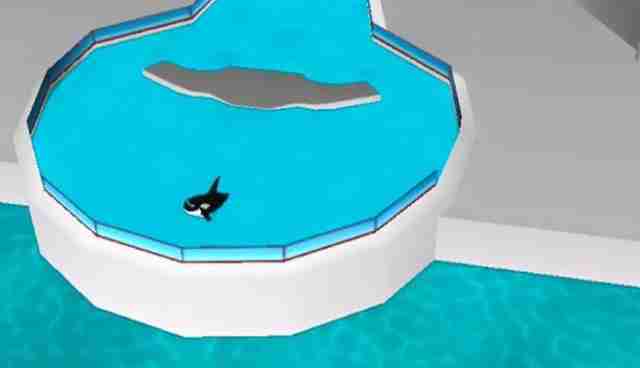 They started the process in the fall of 2014 by doing extensive research on orcas and the negative effects of captivity. Brad says, "Once Michael and I began our research, it was insane how many facts we found on the negative effects of captivity." He adds, "It really doesn't take long before you realize these mammals are about as close to being tortured as it gets. Right from the very beginning it's wrong, and a very disrespectful thing to even capture these majestic creatures, let alone hold them in captivity." With the idea and research in place, the next step involved finding a game developer. That's when Brad contacted an acquaintance whose family owned the development company Navigator Multimedia. "Sharing our ideas with them, they seemed to grasp our vision right away, and Michael and I knew we had found the right people to help create our app," he says. Over the course of the next six months, Hightail Whale was born. Michael says the game is offered for free with in-app purchasing options, but it's not about profit, as some skeptics might assume. "We donate 10 percent of all profits to the Whale Dolphin Conservation Society. We hope this number turns out to be significant so they can continue to expand their good works," he says. Brad also notes that he and Michael have so far invested about $50,000 to produce the app. "With 30 percent going to Apple, and 10 percent going to Whale Dolphin Conservation, our shared 60 percent will be paying back the initial investment, as well as continued game updates and improvements," he says. 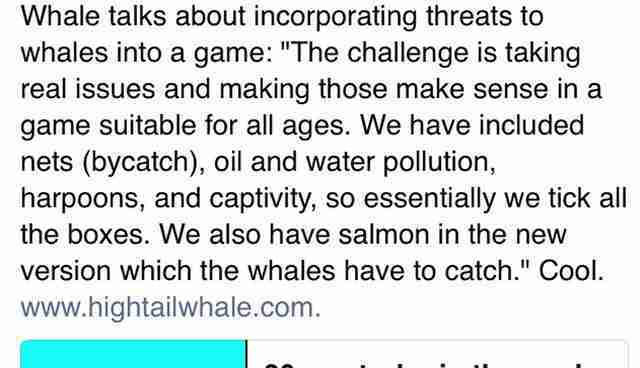 Michael emphasizes that Eco Game Solutions is committed to the conservation of whales and ending captivity, while the game itself is "more a labor of love, borne out of a passion to see change, than a money-making venture." One challenge faced in developing the game was in how to present real issues in an entertaining format, that people could easily understand and learn from. "We tried hard to be accurate for the experts, but also to ensure the game is fun and educational for users of all ages," Michael says. Another unique highlight of the game is one in which the whales try to catch and eat salmon. This facet of the game is meant to draw attention to the necessity of generating more Chinook salmon for endangered resident orcas of the Pacific Northwest. Experts believe this is the best way to increase their chances of survival. And let's not overlook the fun choice of characters. There are three to choose from: Turbo the Orca, Little Moby the Sperm Whale, and Belle the Beluga. Each character has its own unique, correct swimming motion, and specific information about its species. And although Apple recommends a minimum age for rating purposes, the game is appealing to all ages. Michael says, "Truthfully, anyone with a passion for whales will love this game. We have users ranging from 4 years old to those in their late 70s." For now, the goal of this small start-up with a big idea is to spread awareness, increase exposure, and hope that its crucial message catches on. "Once people learn how wrong captivity is, we hope they will decide against visiting aquariums," Michael says. The creative duo hopes to grow Eco Game Solutions into a company that specializes in making similar apps to help other animals, as orcas are not the only ones in trouble, and to have a library of titles with an endangered, conservation message. Their mindset is a simple truth: If people can become passionate about these issues, the future of all animals will be more secure. In the meantime, try playing Hightail Whale. You'll come away with a deeper understanding of whales, and also learn some hard-hitting, sad facts about the often fatal consequences of captivity. And best of all, you'll be helping to save lives. 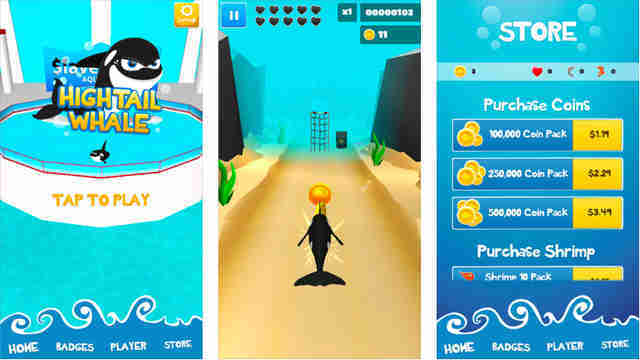 Hightail Whale is designed for both iPhone and iPad, and is available to download on iTunes.